I’m ready for all things Fall! And that includes these Maple-Bacon Cinnamon Cupcakes! These heavenly little cakes are light and fluffy with a hint of maple flavoring inside. Next, is that wonderful sugary bakery-style frosting flavored with maple extract and ground cinnamon which pairs perfectly with the maple flavored cupcakes. Last but not least, for that finishing touch we topped it off with a piece of candied bacon! 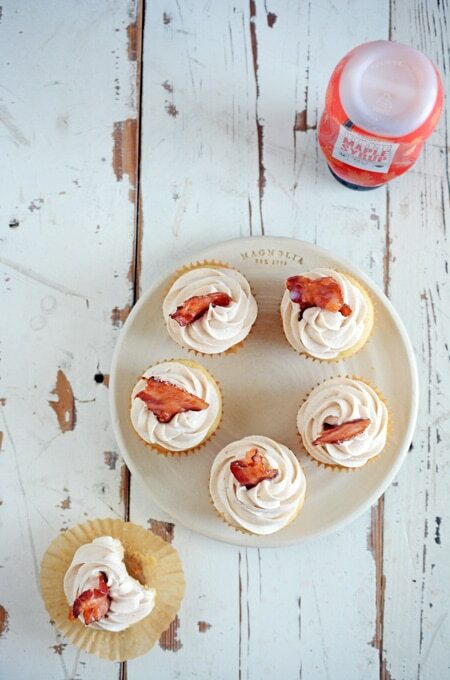 TIP: Be sure you make the bacon the same day you plan on serving the Maple-Bacon Cinnamon Cupcakes. 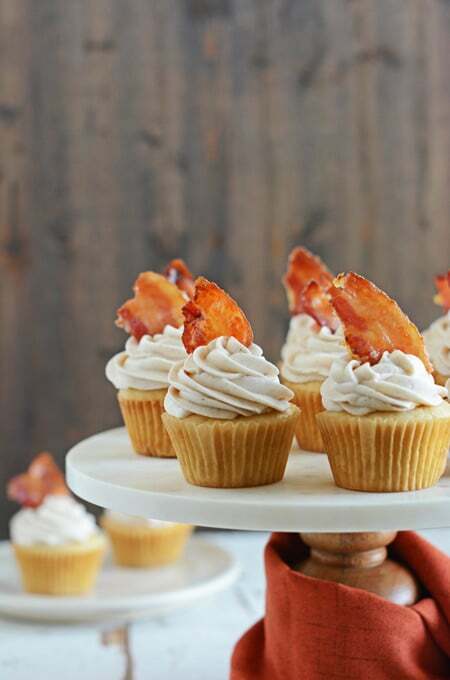 It’s a good idea to make a few extra pieces of bacon so you can choose the best looking bacon pieces to top your cupcakes with. What are some of your favorite Fall desserts? Let me know in the comments. You can also follow The Cake Chica on these social media platforms: Facebook, Instagram, Twitter, Pinterest and Yummly. 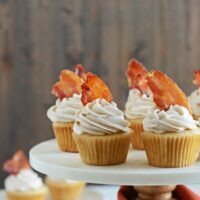 If you enjoyed this recipe for Maple-Bacon Cinnamon Cupcakes you might also like these: Mississippi Mud Cupcakes, Chocolate Cupcakes with Caramel-Espresso Buttercream and Chocolate Cream Cupcakes. 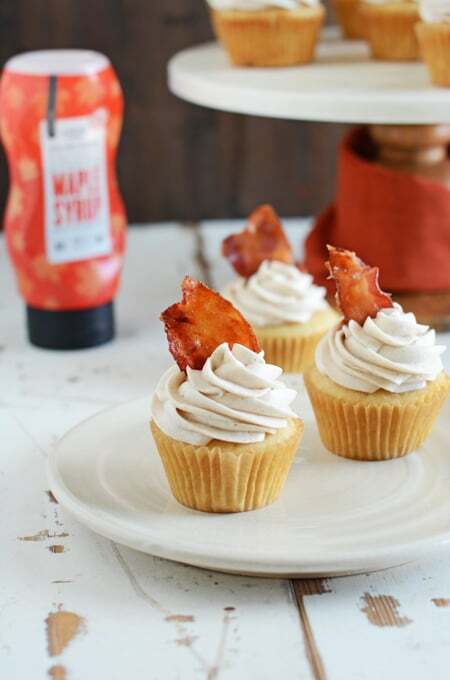 I made this recipe for Maple-Bacon Cinnamon Cupcakes with Thrive Market brand real maple syrup. 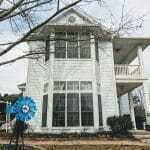 Click my affiliate banner below to find out how you can get set up with organic pantry ingredients delivered right to your door at wholesale prices. Adjust an oven rack to the center position and heat oven to 350 degrees. Prepare a cupcake pan with cupcake liners. In a medium bowl, whisk together the flour, baking powder and salt. In a small measuring cup add milk and maple syrup and stir to combine. In the bowl of a stand mixer beat the butter, granulated sugar and brown sugar together until light and fluffy, about 4 minutes. Add the sour cream, vanilla extract, and maple extract and mix until combined. Add 2 of the egg whites and mix until combined. Add the remaining 2 egg whites and mix until combined. Scrape down the sides of the bowl as needed. Add half of the dry ingredients to the wet ingredients in the mixer bowl and mix until combined. Pour in the milk mixture and mix until combined. Add the remaining dry ingredients and mix until combined. Give the batter a final stir by hand with a silicone spatula to be sure the ingredients are incorporated. Fill the cupcake liners about half way with batter. 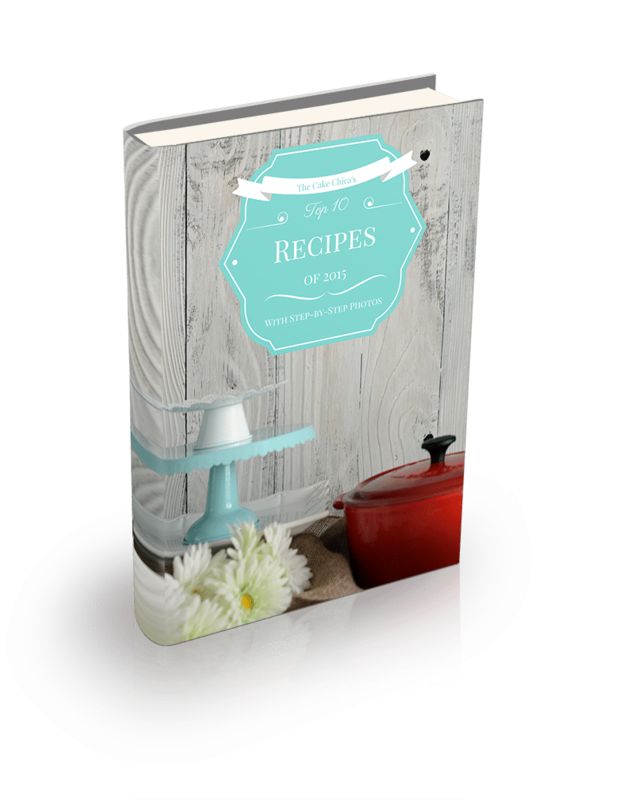 Bake cupcakes until a wooden skewer inserted in the centers come out clean or with a few moist crumbs attached, about 15 to 17 minutes. Allow cupcakes to cool in the pan for 3 minutes, and then transfer them to a wire cooling rack to cool completely. In a bowl of a stand mixer, beat the butter and shortening together until smooth. Add 2 cups powdered sugar and beat until smooth. Add the maple extract, ground cinnamon, water or milk and beat until smooth. Add the remaining powdered sugar and beat until smooth and combined. Adjust and oven rack to the center of the oven and preheat to 350 degrees. Line a baking sheet with parchment paper. Cut bacon slices in 3 inch pieces. Place bacon pieces on the prepared baking sheet. 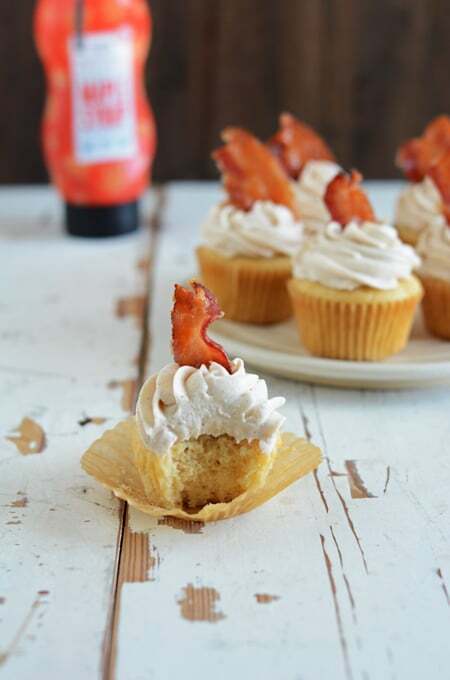 Be sure to have enough bacon pieces to top each cupcake plus a few extra. Bake the bacon for about 10 minutes. While the bacon is baking, combine the maple syrup and brown sugar in a small bowl. Remove the bacon from the oven and brush the bacon with the sugar mixture, then bake again for another 10 to 15 minutes until crispy. Remove bacon from the oven and cool completely. Frost the cupcakes with you choice of piping tip, I used Wilton 1M Piping Tip . 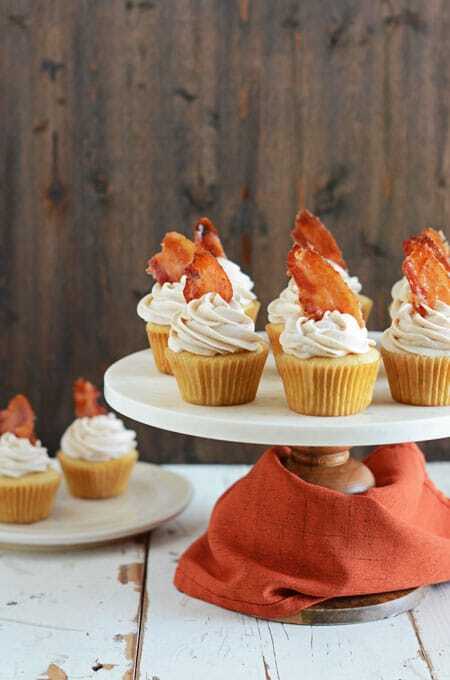 Top each cupcake with a piece of bacon. Unfrosted cupcakes can be stored on the counter in an airtight container for 2 to 3 days. Frosted cupcakes can be stored in the refrigerator for 2-3 days in an air tight container. Bring to room temperature before serving. Candied bacon should be made the day the cupcakes are served.